Is there such a thing as a legal online lottery in India? That’s the first question to ask before looking at international lotteries and dreaming of winning the big Powerball or EuroMillions jackpot. As a local, you do have access to offline options but chances are that the lottery enthusiast in you wants a bigger number of choices. Let’s explore online lotteries in India, what the legal characteristics are and if you need to do anything special in order to play such games. Indian Lottery Laws and Regulations: Are Online Lottos Even Allowed? Before exploring how to buy online lottery tickets in India, let’s take a deeper look at the legal specifics. There are some restrictions in India that apply to playing lotteries and accessing web-based ticket buying opportunities. The problem stems from the fact that each individual Indian state has the right to determine local laws and impose regulations that differ from the framework in the rest of the country. Individual states do control the local lottery jurisdiction, how drawings take place and what percentage of the sums generated through ticket sales go to support good causes. When thinking about any lotto in India, these are the essentials to keep in mind. Currently, lotteries are legal in 13 states (as per 2017 legislative information). The Supreme Court gave the local governing bodies a right to ban lotteries and many have made use of this opportunity. States like Maharashtra, Kerala, Mizoram, Sikkim, and Nagaland have quite popular and legal local lotteries. People living in other parts of India aren’t as lucky. Their only chance is to play an international lottery for a chance to win some much-needed cash. As far as international lotteries go, Indian citizens have a lot more freedom. Online lottery tickets in India provided via international websites are legal. The drawings that take place out of the country are governed by the legislative framework in the respective place. Thus, a lottery that’s organized and taking place in the US is subjected to US jurisdiction, regardless of the fact that international players have the freedom to buy tickets. The ban itself also isn’t very effective because people in the states that ban lottery ticket sales do have access to online options. Needless to say, many illegal lotteries have also come into existence. If you live in one of the states that feature a ban, however, it would be much safer to play lottery online in India. Illegal lotteries come with the risk of being a scam. Online ticket buying is provided with various guarantees that reduce the risk of losing money. Now that you know there are no legal obstacles standing in the way of Indian online lottery (as well as international lotteries), it’s time to find out what it takes to buy tickets. The first and the most important thing is to choose the right website for the purchase of international lottery tickets. If you’ve ever done a bit of research, you know already there are dozens of options. One of the easiest ways to filter between them is to determine which international lottery you’d like to play and to begin searching for an online portal on the basis of this requirement. The next thing to consider is the addition and the withdrawal of funds. Because you’re in India, you may have to deal with certain limitations as far as financial are concerned. At the time being, PayPal offers only limited accounts to people in India. Inter-country payments within India aren’t supported. Only debit and credit card transfers are allowed. The reason for these restrictions is that the Reserve Bank of India (RBI) has certain regulations that prevent PayPal from operating in India like it does in other countries. Most of the PayPal functionalities are disabled in India, which is why international lottery ticket sale platforms that utilize this payment method will not be the most convenient option as far as Indian citizens are concerned. There are Indian-based platforms that sell international tickets and these are your safest bet as far as money deposits and withdrawals are concerned. The local platforms are tailored to the needs of the Indian audience and they’re most convenient. A final very important thing to keep in mind when playing international lotteries is that despite the fact you have acquired funds from another country, you will still be subjected to local income taxes. If the country where the lottery takes place has an income tax on lottery prizes, you will have to pay twice. Before getting started, you may want to talk to an experienced accountant or an attorney to determine what you’ll have to pay and whether the chance is really worth the expenditure. 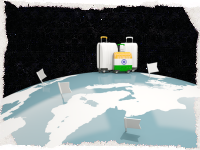 International Online Ticket Buying Opportunities: Yes, They Work in India! 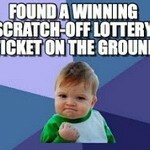 Buying lottery tickets in India online through local websites is a no-brainer. But you may want to explore other options instead of limiting yourself. Options like TheLotter, for example, are popular across the globe. They have huge portfolios of games you can play online and TheLotter operators will be responsible for buying tickets on your behalf. (On a site note – TheLotter is just one of the international ticket buying platforms. There are so many others! Just go out there and explore – you’ll be surprised just how many lotteries you can try without ever leaving the territory of India). Most of these platforms are available in India. They give you a chance to play a medley of games like the US Powerball and Mega Millions, EuroMillions, SuperEnalotto, El Gordo, Oz Lotto, La Primitiva, Brazil’s Quina, Mega Sena, EuroJackpot and many others. When employing such an opportunity to buy your lottery tickets online, keep in mind that the service provider has a small commission. The sum is added to the ticket price. You don’t pay a percentage out of the amount you win – that sum is entirely yours. The tickets, however, are more expensive than what they’d cost local players (something completely natural because the logistics of getting your lottery ticket through an online platform is a bit more complicated than buying in person). Europe, the US, and most other countries across the globe do not have a residency requirement for the purchase of lottery tickets. Thus, the only thing you have to do is make sure you have chosen the right platform that is safe and effective. Safety is ensured through sufficient encryption, having reliable customer support and multiple payment options. You can read online testimonials to make sure others have relied on the respective service provider successfully. Online lottery in India gives you some freedom to overcome the local bans and limitations. Lottery India is not your only choice in a globalized world. If you have never explored such options in the past, you may feel a bit reluctant and worried about their legality. Rest assured – international ticket sales aren’t a new thing and many have already won big prizes this way. 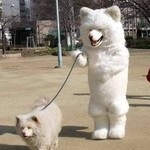 You can start out small to test the respective service provider. If you are happy with the outcome, you’re free to explore many additional options. A big jackpot may be just a few clicks away – don’t hesitate to have a bit of international fun. LOTTO Playing is not possible in India as our bank”s VSA or Master debit/credit card are not getting processed for buying. Any suggestions? Excellent and purely informative, thanks lottoexposed teams to have great work to aware the lotto lover around the globe. 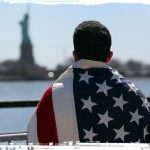 I’m a US Citizen Currently Abroad – Can I Play the Lottery? Who Owns that Lottery Ticket? Let’s Clarify! Move Over Powerball, Scratch-Offs Are Moving In! Which Would You Rather Play?